In the Sunday edition of the The Pittsburgh Post Gazette, food critic China Millman wrote a great article about the impact of Starbucks acquiring the The Coffee Brewing Company, makers of the Clover coffee brewing system. We have had a few folks ask our opinion…so be careful what you ask for. By the way, check out the article. Luke from 21st Street Coffee and Rich from Aldo’s give their perspectives. The Clover is a uniquely designed brewing system (i.e. for brewed coffee not espresso) that allows the operator to adjust for specific parameters like temperature, volume and grind to yield the best characteristics of a coffee. My first thoughts are that Starbucks recognized a great thing and seized the idea in order to help with their new strategy of attending to the coffee and to their customers. I also think given the size and reach of Starbucks they will continue to help educate consumers about coffee. I had the chance to try my first Clover brewed coffee about two and a half years ago when visiting Batdorf and Bronson in Olympia, WA. I don’t remember which coffee I had but I remember thinking Whoa! Since that visit we discussed whether having a Clover at Tazza D’Oro made sense not only from the investment standpoint ($11,000) but whether it really worked for our customers and our vision for Tazza D’Oro. Personally, I wanted a Clover for the shop because I am all about the gear and gadgets and finding a better way to do things. We never took the plunge with the Clover only because it was difficult for me to add it to our business without changing our business model. But while great brewed coffee has to start with well chosen green coffee and skillful roasting, several techniques can be used after that to brew delicious coffee. At Tazza D’Oro, our passion for the coffee and the connection with our customers has a lot to do with what we call “the coffee experience”. And for us the “coffee experience” is about sitting at a table with our customers, pouring hot water into either a French Press or Chemex Coffee Brewer, and allowing the coffee to brew while there is lots of discussion about the coffee and lots of connection around the table. The clover was based after all on the French Press design and while less precise, these low tech machines also make an awesome cup of coffee. Hopefully, our passion about the coffee impacts our customers in a way that creates accessibility to the coffee and to brewing techniques that they can create at home. This has always been my vision for Tazza D’Oro. 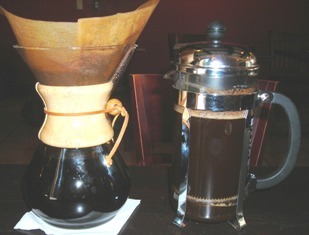 i love that damn chemex. so pretty and also makes a damn good cup of coffee.